People have strong opinions about hiking boots. The common reason why hikers feel that you need them is ankle support. I’ve found that it doesn’t matter much. In fact, I’ve hiked and backpacked barefoot without ever rolling an ankle. Barefoot hiking was an interesting experiment. But looking at the trail in fear of stepping on a twig or pebble is a drag. The main reason why you need shoes is to protect your feet from rocks and debris on the trail. Hiking footwear should also have good grip, keep your feet dry, and be light enough to move easily. Many Appalachian Trail through-hikers use trail running shoes. So you don’t need hiking boots, maybe. This is your best bet for hiking. A good trail running shoe has traction, is waterproof, and are light enough for you to move nimbly on the trail. You can step on debris and it’s not a big deal. Think of them as modern day moccasins. I day hike and backpack with some version of a trail runner and they’re always kind to my feet and get the job done. You can see what I’m wearing now on my gear page. The La Sportiva Synthesis – a great beefed up trail runner / hiking boot hybrid that I used before it was discontinued. It’s basically a beefed up trail running shoe. Even though I only use them for certain occasions, I do have a pair of hiking boots. I use them when the trail is wet and muddy, or rocky. In these cases, my shoes generally get caked in mud, my feet get wet, and it’s a pretty miserable experience. But not so with the boots – they protect and keep my feet dry. Good hiking boots offer a maximum level of protection. You don’t feel much of the trail, but you can plow through it. They are heavier, and you use more energy wearing them. If you’re hiking in extreme conditions, and you just want to be sure that you’re feet are 100% protected, go with hiking boots. The best hiking boots that I’ve owned – the Asolo Fugitive GTX. My favorites are the Asolo Fugitive GTX, My last pair lasted for 8 years of hikes in the mountains, deserts, jungles, and cities. I went through a period where I wore my Chaco hiking sandals all the time. They were comfortable, but had some drawbacks. I loved wearing them on hot days. If I had to ford streams or just wanted to cool my feet off in a lake, these were awesome. But they don’t offer much protection. If you’ll be hiking on trails with little debris in hot climates, hiking sandals are your move. Some people swear by these, so if you’re willing to put up with occasional twig in your foot, give them a try. 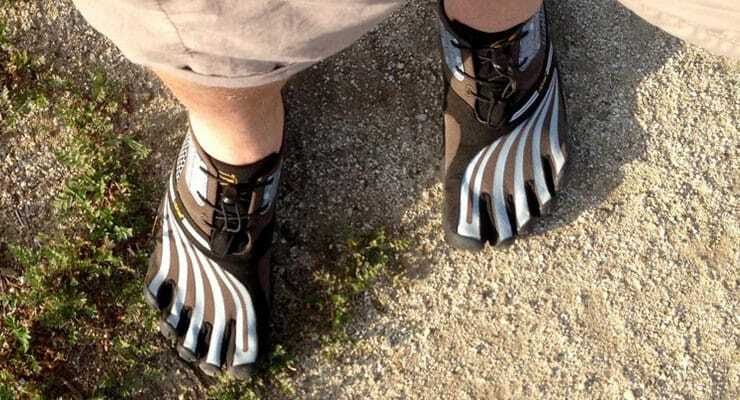 Like Chacos, Vibram Five Fingers have a loyal following. I have a pair of Spyridon shoes that I tried out for a few months. I used them in all conditions, including an off-trail hike on rocky conditions in the Mojave. They offer good protection, and excellent trail feel and agility. But they always left my feet feeling a little sore. Hiking in Vibram Five Fingers always looks funny. So Do I Need Hiking Boots? Unless you live in very wet or harsh conditions, try a good trail running shoe or trail running / hiking hybrid (see my picks here). If you want maximum protection, go ahead and get a good hiking boot like the Asolo. If you live in a hot climate with good trails, try the Chacos on at an REI. If you’re into minimalist hiking shoes and feel, try the Vibram Five Fingers.